The Oval Room celebrates creative American cooking, attracting DC's power players. : This elegant restaurant is near the real Oval Office at the White House, but its doors are always open to the hungry public. 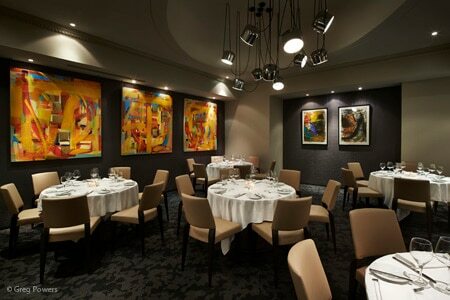 Executive chef John Melfi’s contemporary American menu is offered within a gleaming and modernized décor. A draw for politicos and power people, it is a logistically sensible place to stop for lunch and/or dinner. It is also gastronomically ideal for foodies who crave the best of the market: for example, the burrata appetizer presents soft mozzarella atop finely shredded cucumbers and globe artichokes, all dressed with a lemon vinaigrette and garnished with a sprinkling of edible flowers. Or consider the tuna sashimi, accented with bits of ruby grapefruit and a yuzu emulsion. Move on to one of three salads or a corned duck breast Reuben, or select a more abundant entrée: black sea bass on a bed of charred fennel; crispy skin salmon with roasted baby beets and horseradish crème fraîche. And this is only for lunch. The dinner menu, expanded and more formal, has both raw or hot and cold appetizers such as truffle pasta or char-grilled octopus. And main courses, while including the sea bass and salmon, feature pan-roasted venison, a rack of lamb, and tamarind-glazed squab as well. Dessert choices may vary, but if the peanut butter cake wedge topped with a thick layer of dense chocolate fudge should appear, snap it up. The extensive wine and liquor selections offer ample pairing possibilities.